It’s an ambitious task to set oneself, defining ‘new,’ ‘Australian,’ or ‘art.’ It might be more ambitious still to combine these words into one nebulous phrase, and to use that phrase as the rationale for an exhibition across three of Sydney’s most major public art institutions. 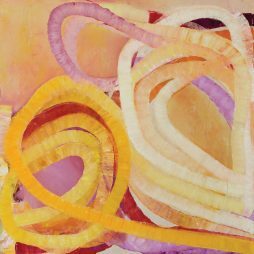 In light of this difficulty of definition that sits at the heart of ‘The National: New Australian Art’, it is a deft curatorial decision to avoid drawing boundaries around these key terms at all, instead revelling in their ambiguity and plurality. 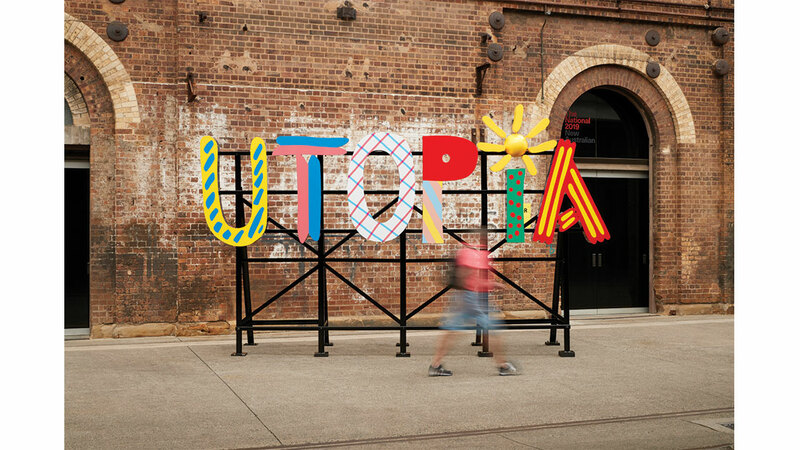 Twentieth-century ideas of utopia sometimes position the concept as ‘an ideality that can be distilled from the past and used to imagine a future.’1 At Carriageworks, dystopia is figured in much the same way: as emerging from a concrete, traceable past and projecting into a malleable future. Here, this future is often marked out by a relationship to screens and digital technology. The first piece audiences encounter upon entering the space is Nat Thomas’s Postcards from the Edge. Modelled on Carrie Fisher’s semi-autobiographical film of the same name, the work suggests that ‘new Australian art’ may be – at least in part – a kind of archaeological dig through our shared cultural history. 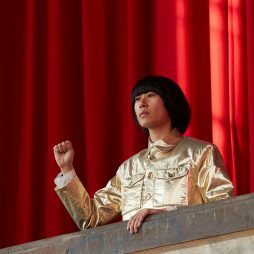 It’s wry too, though; just as it opens up questions of how we have portrayed ourselves in our cultural past, and critiques Insta-self performance, it invites audiences to participate in the very phenomena it calls out. 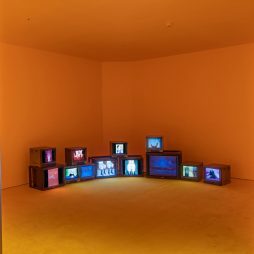 A set of steps off to the left side of the installation gives viewers a platform from which to step up into the work, and assume the position of Meryl Streep – presumably so friends can film them and post it to social media. Best to get that impulse out of the way right at the start, perhaps. Indeed, the whole show at Carriageworks is highly instagrammable. 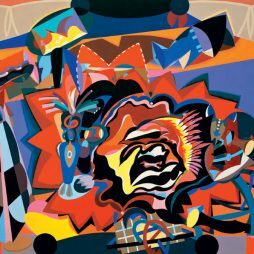 This sits interestingly, and not entirely comfortably, with the investment in retracing personal and cultural histories that many works in the show display. We (probably) want to take videos of our friends climbing aboard Postcards from the Edge. We (probably) feel a little stranger re-posting snippets from Cherine Fahd’s 1-1405, a footnoted documentary photographic series presenting archival family photographs to the viewing public. Excavations of the past are both digital and analogue, vibrant and discomforting; on opposite walls, Melanie Jame Wolf’s four-channel video OH YEAH TONIGHT open-endedly burlesques the lexicon of popular music, while Sean Rafferty’s installation Cartonography uses cardboard fruit boxes to map systems of producing and trading fruit across Australia. 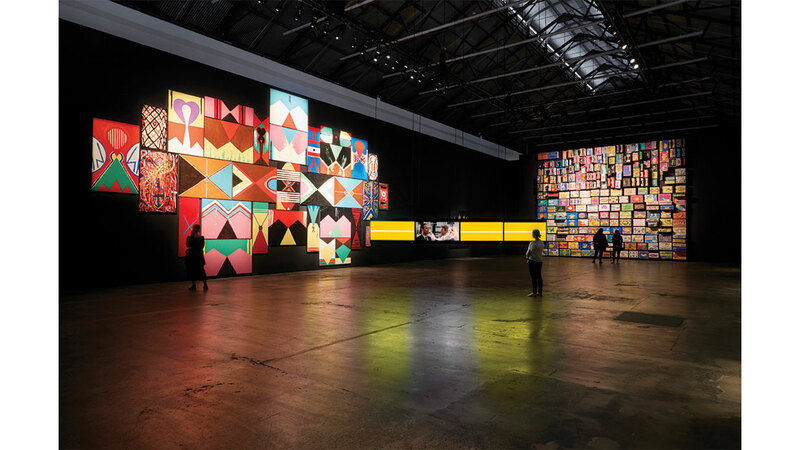 The cavernous open space where most of the show sits at Carriageworks, is glitzy even as it is tonally critical and, often, thematically confronting. Troy-Anthony Balyis’s stunning text-based installation Postcards covers most of one side wall with glomesh that simultaneously retraces colonial history and offers a spectacular suggestion for how this history might be remixed into a – literally – brighter future. The show is dark and loud. 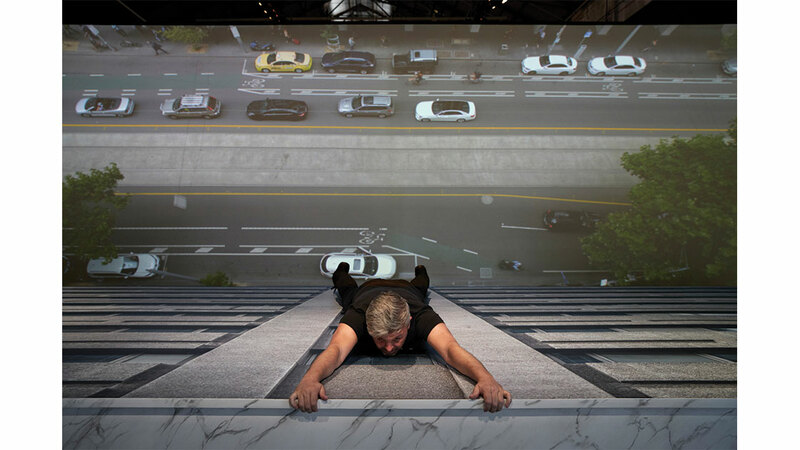 The anticlimax of reaching the mural-backdrop of Mark Shorter’s performance piece Song for von Guerard without a performance running is a welcome relief —– the perfect gentle deflation after a thematically and visually fluorescent show. 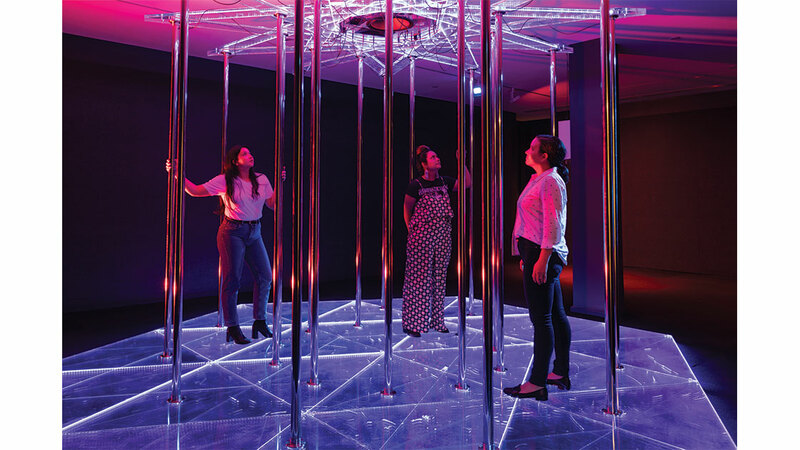 At the Museum of Contemporary Art Australia (MCA), curators Clothilde Bullen and Anna Davis emphasise the diversity of the artists they display. As a conceptual framework, this diversity-based approach might be the most mercurial method taken up across ‘The National’. 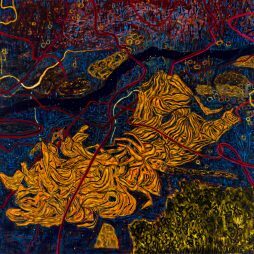 Of course, we can think about how artists from regional areas sit with those from eastern coastal cities, how men and women sit together, how Indigenous artists sit with recently-arrived Australians, or Australian expatriates working the world over. But these questions, relevant though they are, somehow feel not quite the ‘new’est questions we might be asking, especially of such exciting work as the MCA has on display here. Instead, the arrangement of the rooms seems to cue us to ask about the relationship of ‘old’ modes of making to new – read ‘digital’ – media. It’s refreshing here to see drawings by Teo Treloar that take up the aesthetic of earlier Modernism. Treloar’s work, running across several wall spaces, gives us flat planar shapes in perspectively ambiguous space, looking Surreal at times and Constructivist at others. Treloar uses this drawing practice to reflect on personal experiences of mental health, and to throw a spanner at the cliché of the tortured (male) genius artist. In an adjacent room, we find Kylie Baynard’s Modes of Associated Living, a series of large figurative paintings. These paintings provide a window of potential connection between the MCA and the show at Carriageworks: like many of the artists in Cunningham’s show, Baynard mines and reconfigures historical image archives. 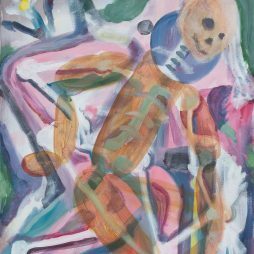 It’s enjoyably jarring to see a room at the MCA filled with figurative painting, and the re-crafting of the archive that Baynard carries out is deft, imaginative, and optimistic. Other ‘traditional’ and analogue modes of making do occupy much of the show at the MCA. 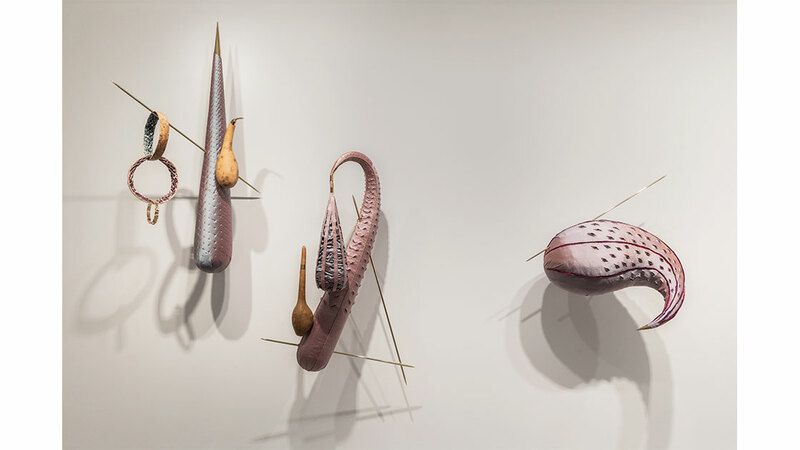 Janet Fieldhouse’s ceramic Hybrid series, with its warm palette and incorporation of feathers and twine, calls to cultural traditions from the Torres Strait and beyond, while Julia Robinson’s textile series gives us a visual banquet of Elizabethan aesthetics, symbols, and rituals of fertility in dialogue with Hieronymus Bosch’s Garden of Earthly Delights. These pieces dovetail through the space in tandem with works centred on digital technologies. The choice to keep analogue and digital modes of making in separate spaces, which tesselate with each other to fill the gallery, brings this dichotomy between future-facing and retroactive works to the fore. Standouts amongst ‘new’ media works include Ross Manning’s Wave Opus I &II, in which LEDs dangle from the ceiling on wires, moved by old computer fans, producing an improvised soundscape as they hit the debris that Manning has left on the floor beneath them. 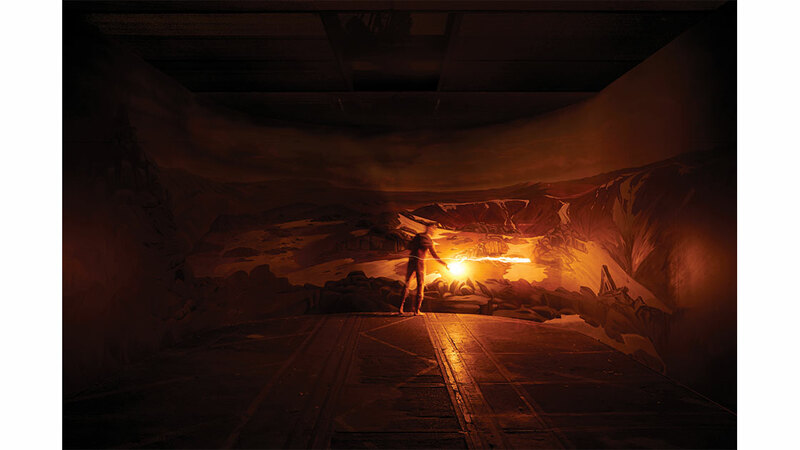 Aural agency switches hands in Lucas Abela’s Fort Thunder. Here, audiences are invited to create experimental electronic compositions using their bodies in contact with the sound-making playspace that the artist has created. 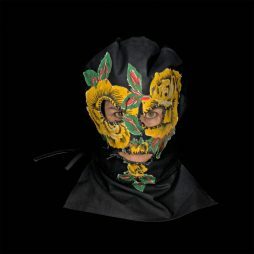 Coming from Abela’s position that experimental music is more rewarding to create than to listen to, the work is pure jubilation with satisfying self-awareness on the side. An affective high point of the show at the MCA is Abdul-Rahman Abdullah’s ethereal, dreamlike retelling of family history in Pretty Beach. 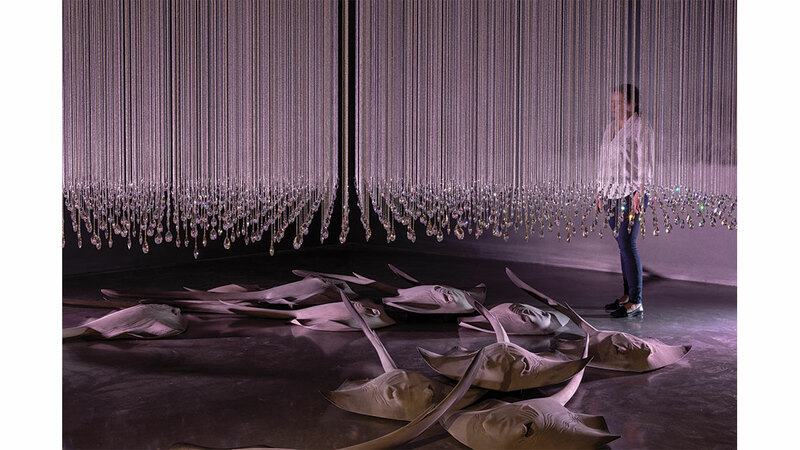 Submerged in darkness, luminous and floating in the liminal space between ceiling and floor, sculpted stingrays hang beneath a swirl of softly glistening crystals. 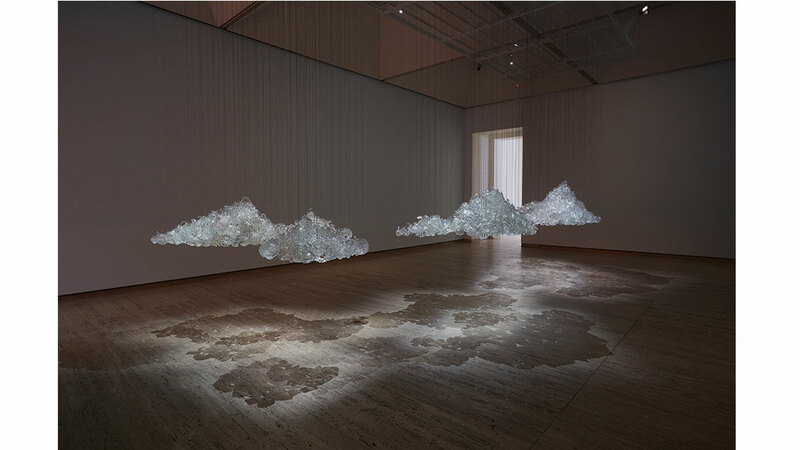 There are formal and affective parallels here between Abdullah’s work and Nicholas Folland’s equally tender Floe at the AGNSW, in which pieces of old crystal glassware float above the floor in gentle, fragile cloud formations. 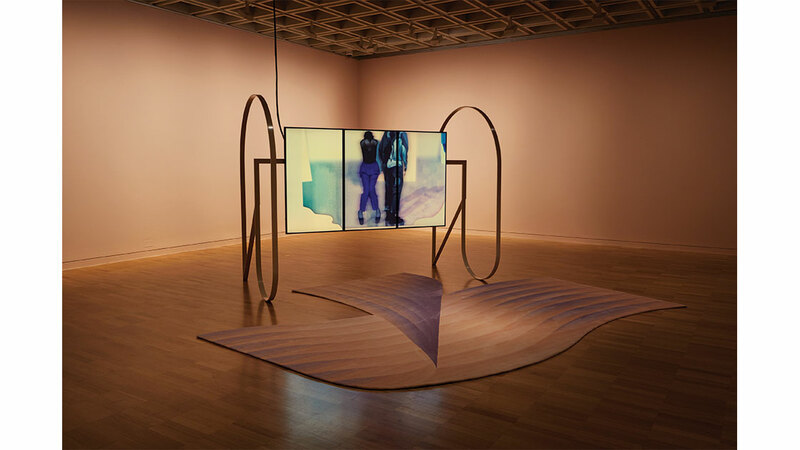 At the Art Gallery of New South Wales (AGNSW), Isobel Parker Philip has perhaps the most strongly imposed curatorial imperative. That is, her take on ‘new Australian art’ as an inherently political exercise, always concerned with reflecting the precariousness of the present, is the most fully articulated in wall text and accompanying materials. Certainly, a lot of the work benefits from being read this way. Linda Marrinon’s Woman and children, Albert, France stands up to a reading of the feminine figure as defiant, hopeful, rising out of ruin. Elsewhere, Peta Clancy’s photographic series Undercurrent warrants a reading as an investigation of colonial frontier violence. There are other, equally interesting, concerns at play in the AGNSW though. Two of the most captivating works amongst the collection dip in and out of narrative in their exploration of personal relationships and affective experience. nova Milne’s video and sculptural installation Skin Without Biography sees the bodies of the artist-duo ebb and flow through each other and through time, as they dance toward, around, with, and without each other. A carpet in marshmallow pink and purple brings textural and emotive softness to the room. 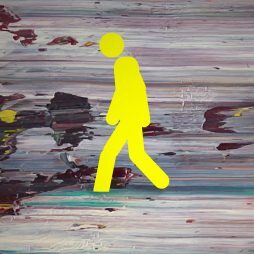 James Newitt’s Fossil also grasps at the edge of decipherable narrative, giving us an auditory outline of intimacy as we sit in a hard-lined concrete space, on the edge of our seats. 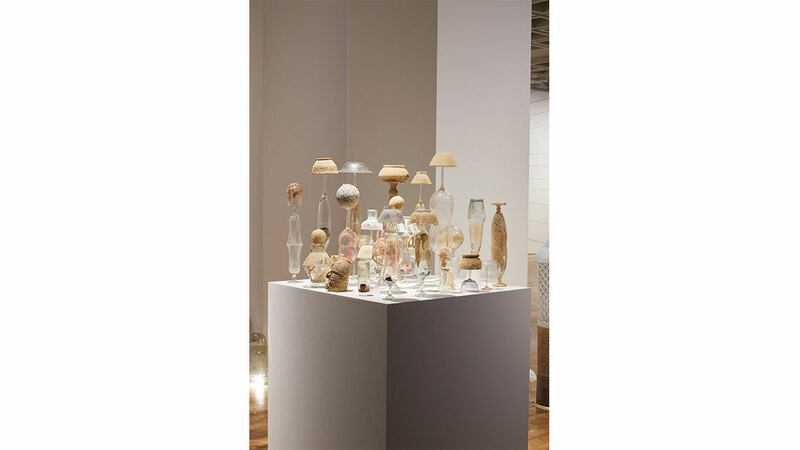 The congruence of the scientific and the imaginative, or the emotive, is another recurrent theme at the AGNSW, and one that is worked with moving results. Koji Ryui’s installation TOT weaves imagination together with visual tropes of historical and scientific display. Gesturing both the to decay and (re)growth, the work gently – indeed, caringly – calls up ideas of loss and of reparation in equal part. Elsewhere, Mira Gojak’s Stops fuses the science of blue skies with a philosophy of freedom and its restriction. 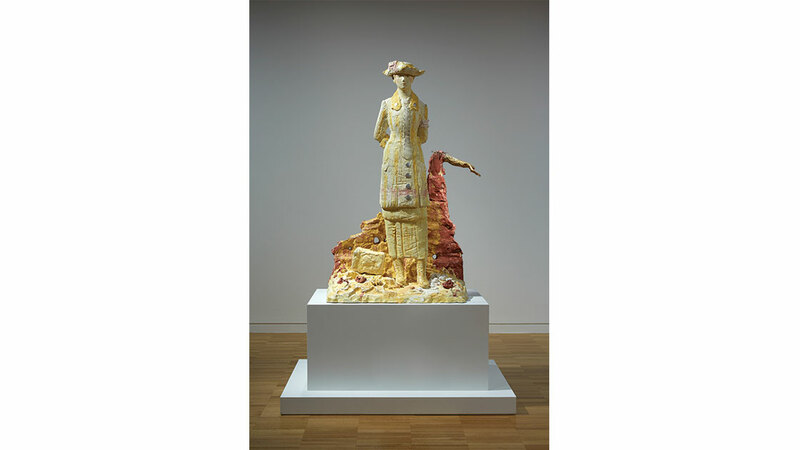 The wool in these sculptures is like the carpet in Skin Without Biography; both bring softness, and room to move and to think, to the gallery. 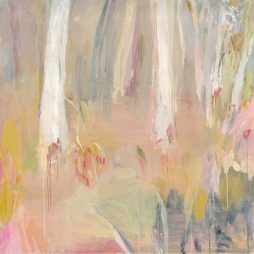 This malleability – this safety not to define terms, but to enjoy their many possibilities – makes ‘The National: New Australian Art’ a fascinating, dense, and multivalent exercise in cataloguing the here and now. José Esteban Muñoz, Cruising Utopia: The Here and Now of Queer Futurity (New York: New York University Press, 2009), 1. Muñoz, here, is mainly referencing the utopian though of Ernst Bloch, especially The Principal of Hope.